For ither uises, see Goa (disambiguation). ^* Konkani is the sole offeecial leid but Marathi is alloued tae be uised for ony or aw offeecial purposes. Goa i/ˈɡoʊ.ə/ is Indie's smawest state bi aurie an the fowert smawest bi population. Goa is Indie's richest state wi a GDP per caipita twa an a hauf times that o the kintra as a whole. It wis rankit the best placit state bi the Eleventh Finance Commission for its infrastructur an rankit on top for the best quality o life in Indie bi the Naitional Commission on Population based on the 12 Indicators. Panaji is the state's caipital, while Vasco da Gama is the lairgest ceety. The historic ceety o Margao still exhibits the cultural influence o the Portuguese, who first laundit in the early 16t century as merchants an conquered it soon thereafter. Goa is a umwhile Portuguese province; the Portuguese overseas territory o Portuguese Indie existit for aboot 450 years till it wis annexed bi Indie in 1961. Renouned for its beaches, places o wirship an warld heritage airchitectur, Goa is visitit bi lairge nummers o internaitional an domestic tourists each year. It haes rich flora an fauna an aw, awin tae its location on the Wastren Ghats range, which is classifeed as a biodiversity hotspot. In auncient leeteratur, Goa wis kent bi mony names such as Gomanta, Gomanchala, Gopakapattam, Gopakapuri, Govapuri, Govem, an Gomantak. The Indie epic Mahabharata refers tae the aurie nou kent as Goa, as Goparashtra or Govarashtra which means a naition o cowherds. Gopakapuri or Gopakapattanam wur uised in some auncient Sanskrit texts, an these names were mentioned in ither sacred Hindu texts such as the Harivansa an the Skanda Purana an aw. In the third century BCE, Goa wis kent as Aparantha, an is mentioned bi the Greek geografer Ptolemy. The Greeks referred tae Goa as Nelkinda in the 13t century. Some ither historical names for Goa are Sindapur, Sandabur, an Mahassapatam. Talukas o Goa. Talukas in purple shades belang tae North Goa destrict, an orange denote Sooth Goa destrict. The state is dividit intae twa destricts: North Goa an Sooth Goa. Each district is governed by a destrict collector, a admeenistrator appointit bi the Indie govrenment. Panaji is the heidquairters o North Goa destrict. 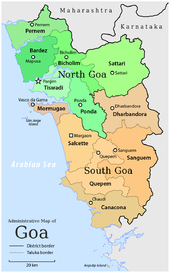 North Goa is further dividit intae fower subdiveesions – Panaji, Bicholim, Mapusa an Ponda; an sax taluks – Tiswadi (Panaji), Bardez (Mapusa), Pernem, Bicholim, Sattari (Valpoi), an Ponda. Margao is the heidquairters o Sooth Goa destrict. Sooth Goa is further dividit intae three subdiveesions – Margao, Mormugao (Vasco da Gama), an Quepem; an sax taluks – Mormugao, Salcete (Margao), Quepem, Canacona (Chaudi), Sanguem, an Dharbandora. Goa's major ceeties include Vasco da Gama, Margao, Panaji, Mapusa an Ponda. Municipal Cooncils (13): Margao, Mormugao (includin Vasco da Gama), Pernem, Mapusa, Bicholim, Sanquelim, Valpoi, Ponda, Cuncolim, Quepem, Curchorem, Sanguem, an Canacona. ↑ "Goa". Commissioner Linguistic Minorities, 42nd Report, July 2003 to June 2004. National Commissioner Linguistic Minorities. Retrieved 17 July 2007. Konkani is the only official language of the state. There actually is no second official language. However, as per notification, Marathi will be used for the purpose of reply by the Government whenever communications are received in that language. ↑ UNI (30 May 2007). "Marathi vs Konkani debate continues in Goa". rediff.com. Rediff.com India Limited. Retrieved 17 July 2007. ↑ Government of Goa. "About Goa". goa.gov.in. Goa Government. At present, Marathi and Konkani are two major languages of Goa. ↑ 4.0 4.1 Reports of the finance commissions of India: First Finance Commission to the Twelfth Finance Commission : the complete report. India. Finance Commission. Academic Foundation. 2005. p. 268. ISBN 81-7188-474-1. ↑ "Liberation of Goa". Government Polytechnic, Panaji. Retrieved 17 July 2007. ↑ Pillarisetti, Jagan. "The Liberation of Goa: an Overview". The Liberation of Goa:1961. bharat-rakshak.com. Retrieved 17 July 2007. ↑ "Goa". National Informatics Centre(NIC). Retrieved 4 January 2009. Wikimedia Commons haes media relatit tae Goa. This page wis last eeditit on 11 Mairch 2018, at 08:40.